The Thomas-Morse S-4 Scout was an American biplane advanced trainer, operated by the Army and Navy. Dubbed the "Tommy" by pilots who flew it, the aircraft became the favorite single-seat training airplane produced in the U.S. during World War I, having a long and varied career beginning with the S4B, which first appeared in the summer of 1917. Built by Thomas-Morse Aircraft in Bath, New York in 1917, it was a compact single-seat open-cockpit biplane of equal span and a 100 hp (75 kW) Gnome rotary. Designed by Englishman Benjamin D. Thomas (no relation), formerly of the Sopwith Aviation Company, the S-4 made her maiden flight in June 1917 in the hands of Paul D. Wilson. Twelve went to the Navy. The S-4B, with a 110 hp Gnome, span of 27’ (8.22 m), and length 20’3” (6.17 m) proved more successful, with three prototypes followed by an order of 97 for the Army and ten for the Navy, while six more were completed with two main and one tail floats as the Navy S-5. The S4B was used by practically every pursuit flying school in the U.S. during 1918. It was supplemented in 1918 by the S-4C, at a cost of US$5400 each. Six prototypes were built, and the 80 hp (60 kW) Gnome B-9 was replaced by the "more reliable" 80 hp (60 kW) Le Rhx�ne C-9 with the fifty-second aircraft. Four S-4Cs with floats went to the Navy, and 461 for the Army. After World War I many "Tommys" were sold as surplus to civilian flying schools, sportsman pilots, and ex-Army fliers. Many were still being used in the mid-1930s for World War I aviation movies, and several continue to exist in flying condition today. A single aircraft was fitted with new tail and 110 hp (82 kW) Le Rhx�ne, becoming the S-4E aerobatic trainer. It was not adopted, and (fitted with a 135 hp (101 kW) Aeromarine V8 engine) became Basil Rowe‘s racer Space-Eater. About sixty surplus aircraft survive in civil service, most fitted with the Curtiss OX-5s. 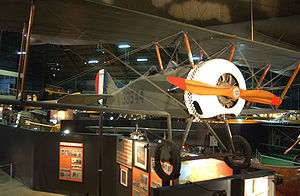 S4C "Scout" is on display at the National Museum of the United States Air Force in Dayton, Ohio. The aircraft was donated to the Museum in March 1965 by Capt. R. W. Duff of Miami, Florida. It was later restored by Aero Mechanics High School in Detroit, Michigan. The aircraft is displayed in the Museum's Early Years gallery. Two S4C's, rebuilt with original metal fitting sets are currently under restoration in Kingsbury Texas. Both are powered with correct LeRhone 80hp rotary engines. "Tommy I" has previously flown at Kingsbury and both aircraft will be flying in the near future. Donald, David, ed. Encyclopedia of World Aircraft, p. 875, "Thomas Brothers and Thomas-Morse aircraft". Etobicoke, Ontario: Prospero Books, 1997. Swanborough, Gordon and Bowers, Peter. United States Navy Aircraft since 1911. London:Putnam, Second edition, 1976. ISBN 0 370 10054 9. Thomas-Morse S-4 Pictures and Thomas-Morse S-4 for Sale.